Foodie Fling – Page 3 – Passion for all the foods. Most people consider Memorial Day weekend the kickoff of summer fun – I consider it the kickoff of summer food. Sadly, many weekend BBQs are the same thing: floppy hot dogs, crushed potato chips, runny baked beans, pasta/potato salad slathered in mayo…blech. I hate it all. 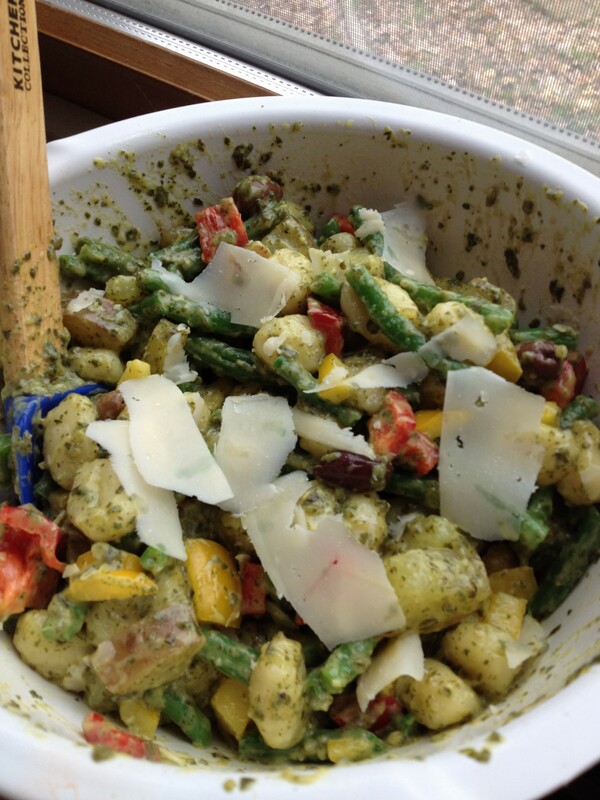 But no one wants to go to a BBQ empty-handed, or leave with an empty stomach – so go with this gnocchi pasta pesto potato salad, and no one will leave with an empty stomach. It’s pasta salad. And potato salad. And pesto. And delicious. Combine ingredients in large bowl, toss to coat with pesto. Refrigerate for 30 minutes. Serve cold or room temperature. There are times when show stopping dessert take hours of prep and baking and cooling and decorating – and then, there’s this. Three ingredients. Three steps. Super-fancy dessert. I mean, look at these – don’t you want them rightnowplease? 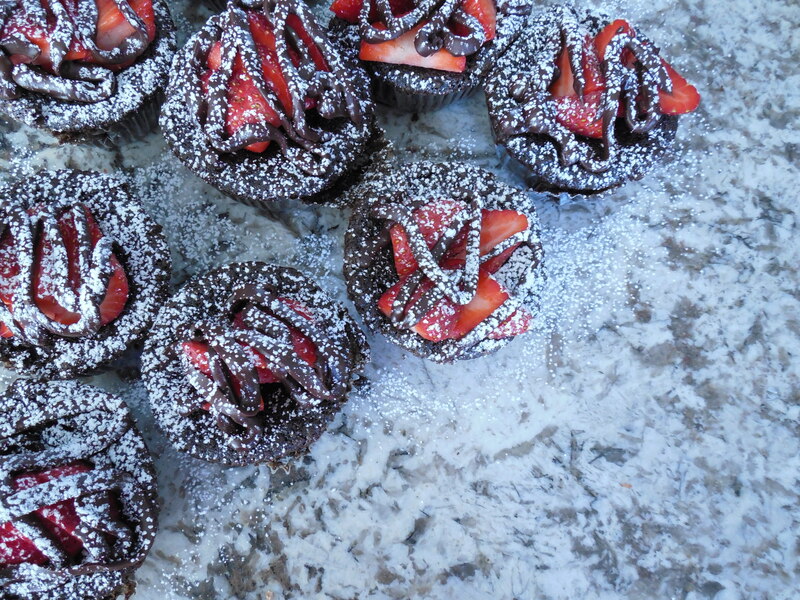 Chocolate cheesecake-stuffed strawberries are the perfect wine club – I mean book club – dessert. Or appetizer. Or snack in general. I made these when I needed a fast book club dessert. I had a menu of about 5 million things (not really, but it was extensive) and I wanted a dessert that fit our ‘obsession’ theme. While carving out the strawberries takes a hot minute, this dessert comes together fairly quickly and easily. But it looks incredibly fancy, because it’s mini and stuffed. It’s light and refreshing but still satisfies the chocolate craving. And if you need to up your class factor, do what I did – and serve these as an appetizer. Hey, fruit and cheese is an appetizer, right? When you hull the strawberries, use your pairing knife to carve out the entire middle of the strawberry. It’s tedious at first, but gets easier once you get the hang of it. Beat together cream cheese and spread until well combined and fluffy. Add mixture to piping tool (or a plastic bag with the corner snipped off.) 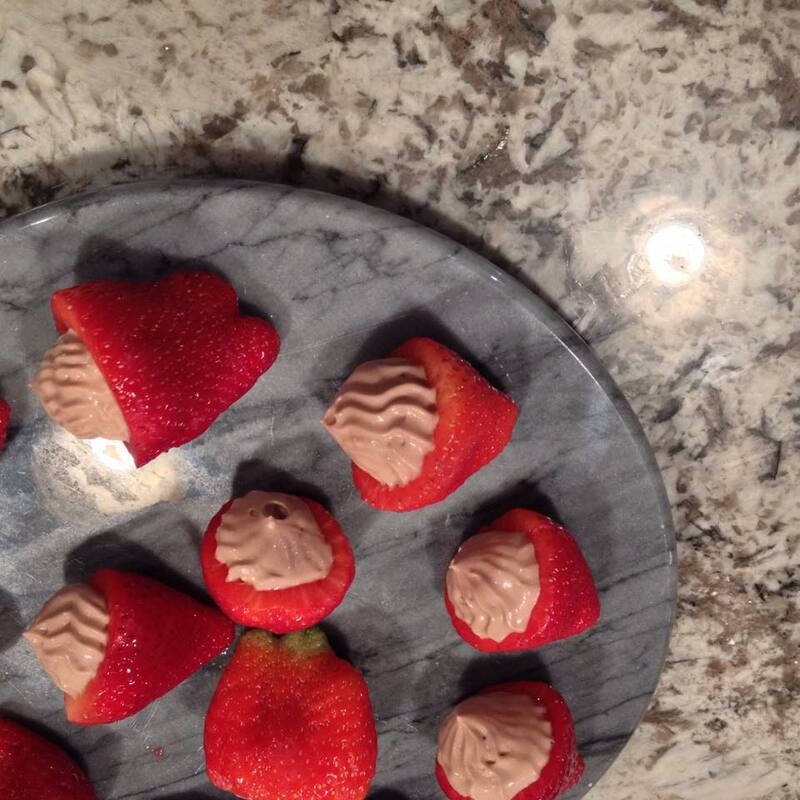 Fill strawberries and serve. Look at you, so fancy! The weather upturn this week has been – knock on wood – a welcome relief to a winter that stopped and started and stretched on. In the beginning, I greet the snow with a kid-like joy, but in the middle…that’s the sweet spot where I certainly don’t want to go play outside, but I’m not usually not sad to be snowed-in, either. Except the snowing in always seems to come at the worst time, when you have plans months in the making with dear friends. What to do but turn a bad day better with baked goods? I used Japanese pears (aka, apple pears), you could use either or a mixture of both fruits. You can glaze it with any kind of preserves you like. You can use your grandmother’s famous pie dough, though I have to tell you, this one is hand down the best I’ve found. It’s delicious right out of the oven, so hot you toss it from hand to hand as your fingers sizzle. It’s amazing cold, out of the refrigerator, standing with the door open in anticipation and then continuing to stand as you eat it right out of the bag. Room temperature, still delightful, as you finish the rest of your baking and go back for ‘just a half piece.’ If you reheat it, make sure you do so in the oven – the texture of the crisp crust as it cracks like ice next to the velvety fruit is the best part. You don’t want to lose it. This is probably one of the most beautiful things I’ve ever made – like pear pie but better. Option 1: cut butter into 1/2 inch dice, and add ingredients to a food processor. Pulse until dough just comes together. Option two: mix flour salt, sugar and yogurt in a bowl. Grate in frozen butter with a cheese grater. Mix until just combined. Wrap in plastic and refrigerate for at least an hour. If your dough is refrigerated more than the time above, let it rest at room temp 15-20 minutes. Heat oven to 450 degrees and put a pizza stone or sheet pan in the oven to warm up. Melt your butter in a small saucepan over medium heat, 3-4 minutes, until it starts to turns brown (it will spit and sputter and smell amazing.) Remove from heat and whisk in vanilla. Cut a piece of parchment paper in about a 10-inch square. Take your dough and roll out to a 12-ish inch circle. (The ends fold over, it’s supposed to look rustic.) Roll dough onto your rolling pin and transfer to your parchment. If you want to be very pretty, slice your pears thinly from opposite side, working your way towards the core. If you don’t care (and I didn’t), core your pears and thinly slice. 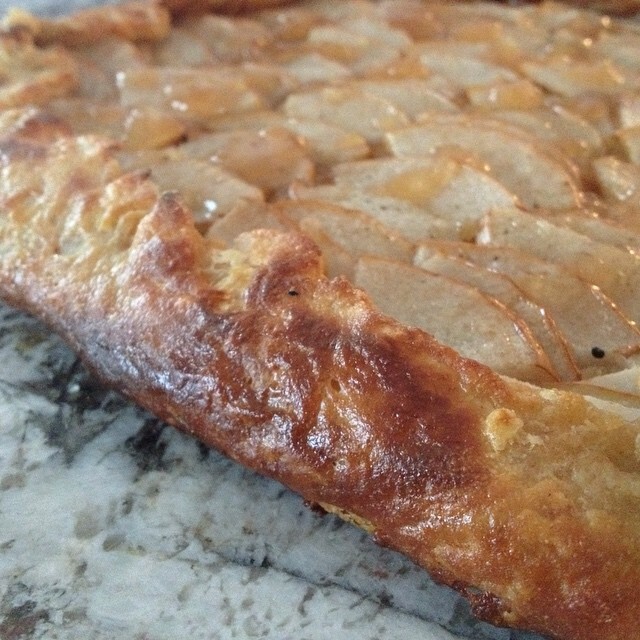 Place your pears in a circular fashion on the tart, leaving a 2-inch border for the crust. Brush your pears with the brown butter mixture. Fold the outer dough in, all the way around. This doesn’t have to be perfect, it’s ok if it looks goofy – this is homemade, not a Fench bakery after all. The less time you spedn futzing, the more time you have to eat. Whisk milk and egg together and brush over the dough border. Slide your tart (using the parchment) onto your hot pan. Bake until golden brown, 20 – 25 minutes. Warm up the preserves and brush onto the cooked pears. Serve warm. There are a few inalienable rights in my world: the right to chasing your own happy. The right to surround yourself with only those who help you chase that happy. And the right to cupcakes, always. I’m especially delighted my friends Merrill and Mike found each other to chase their happy together. But, the fact that they’re gluten and lactose-free sometimes interferes with the cupcakes part. Well, no more. Special people deserve special treats, and these cupcakes are treat to see and eat. Who knew gluten-free and lactose-free could look this good? This cupcake has three layers – the crust, the cupcake and the top. Don’t let that scare you, it’s not super involved as desserts go. The layering makes it look WAY fancier relative to the amount of time/effort it actually takes to make. The cupcake layer is naturally gluten-free, and the secret ingredient is quinoa. For the dairy, I used a form of lactose-free milk that’s relatively new to the market called Fairlife. It tastes like normal milk, but is filtered to have more protein, more calcium, less sugar…and no lactose. Because … science. For the crust, you could use half the amount written and still have a good layer – but everyone loved the thick crust. You could also omit altogether and double the cake recipe (you’d get more than 12 cupcakes, I think.) The topping helps, because the cupcakes will cave in – and obviously, you should fill them with something tasty. For true dairy-free cupcakes, you can sub the chocolate chips with a vegan variety. Yes, I ate this one as a taste test, and no, I’m not ashamed about it. Line cupcake pan with cupcake liners, spray with coking spray. Combine cookies and butter, press firmly into each cupcake liner. Blend milk, eggs and vailla in food prosessr. Add quinoa and butter, blend until smooth. Mix dry ingredients in bowl, add wet and mix until combined. Pour on top of crust layer. Let cool completely and dust with powdered sugar. Melt choclate chips in microwave, using 30-secnd blasts and stirring after each. Add milk and whisk vigourously until combined and gliossy. Pour/scrape mixture into small plastic sandwich bag, cut ff small corner. Hull strawberries, cut them into slices or leave whole (your call). Place in the middle of cooled cupcakes. 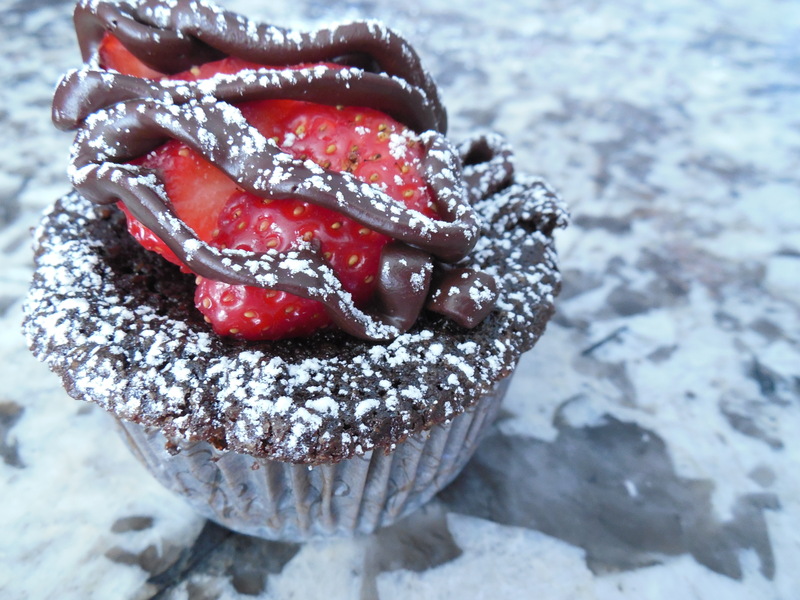 Drizzle chocolate mix over cupcakes. Let it cool and harden compleelty. As much as I love cooking, baking and I are more distant friends. Measuring is a pain, I’m not super exact about ANYTHING and really, sometimes, I’m distracted. Also: baked goods are my kryptonite. I LOVE THEM. I mean candy, whatever, it’s ok. You give me a brownie and I’ll give you a kidney. Whenever I bake something and post it on FB, I get at least one “How do you not weigh 1,000 pounds?” comment. While it seems like a silly question, my dirty secret is: I bake for other people. Like, office people, for example. 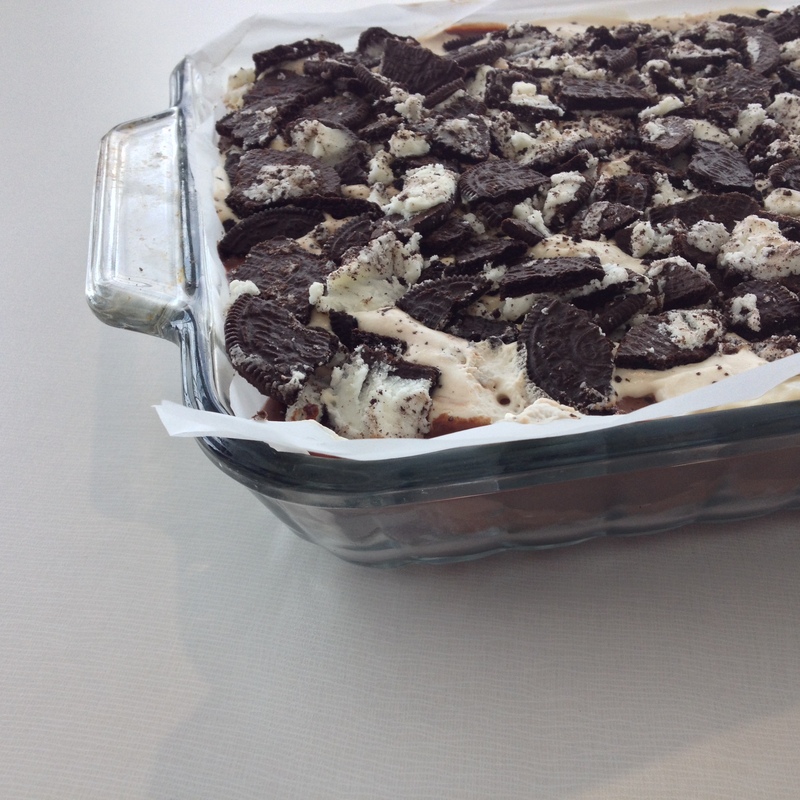 Dani, one of my awesome friends and coworkers, requested an Oreo lasagna. The recipe called for instant pudding and whipped topping, but I made a few…tweaks…in honor of her awesomeness. And I’m not even kidding when I say this 9×13 pan was gone in 10 minutes. Delicious layers of chocolate, chocolate and more chocolate. 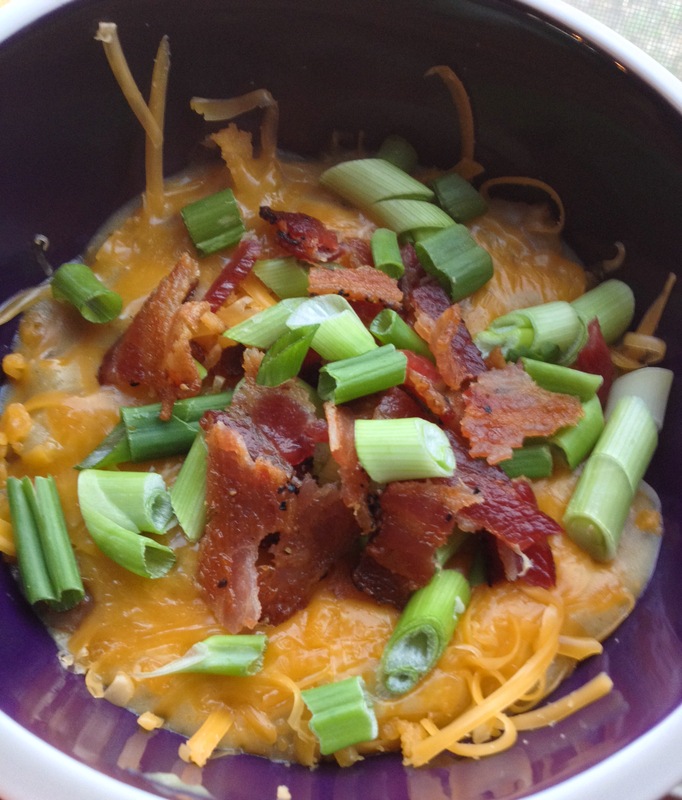 Here’s the thing – this recipe has a lot of steps. I know. It looks scary. But 1. You don’t have to do them all at once, 2. You can sub in anything (just please, please make the bottom layer as written, you won’t be sorry) and 3. It’s even better when you have a good friend (in this case, my sweet Carly) keeping you company while you make it. Spread in the bottom of a 9×13 pan. Normally I would line with parchment – don’t make this mistake, it gets too soggy – just spray with cooking spray. Cover and let chill 2 hours or overnight. Mix cornstarch, sugar and salt in a medium saucepan, then whisk in milk. Go slowly at first, whisking constantly – you can pick up speed as everything incorporates. Heat over medium-low heat, stirring/whisking every once in a while so the mixture doesn’t stick and no lumps form. Once the mixture coats the back of a spoon (about 15-20 minutes for me), whisk in the chocolate, stirring until melted and thickened. Turn off heat, and stir in vanilla. Pour into a large bowl, cover with plastic wrap and refrigerate at least 3 hours and up to overnight. Alternately, mix cream cheese and chocolate hazelnut spread together. Whip cream separately, and fold into cream cheese mixture. It’s up to you – this way will yield you a little more fluff, the other way a little more heft. Whip cream with powered sugar and vanilla until medium peaks form, 6-7 minutes. Spread pudding over crust layer. Spread middle layer over pudding. Spread whipped cream over middle layer and top with hand-crushed cookies.